Cass, Lex and Nicholas investigate crimes, solve mysteries and have brilliant adventures. They’ve even got their own secret clubhouse. 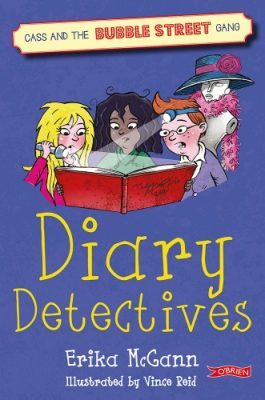 But there’s also a mystery afoot for the Bubble Street Gang: while helping with a car boot sale, Cass finds a very old diary. The name inside the cover has worn away, but it must belong to somebody in Berbel Street. The diary talks about picking on the drama kids on the bus, and finally about a horrible prank played on them during their end-of-year show. Who does this diary belong to? Can the Bubble Street Gang unmask the wicked writer?